Herbert C. “Pete” Hoover was born August 18, 1929 in Kingsville, Missouri and departed this life on March 31, 2019 at Research Medical Center in Kansas City, Missouri, surrounded by the love of his family, at the age of 89 years, 7 months and 13 days. He was the youngest son of Ernest Lee Hoover, Sr. and Mabel (Patterson) Hoover. As a small child, Herbert’s favorite book was The Tale of Peter Rabbit, he asked it be read to him so many times that his family started calling him Pete. Pete was very close to his maternal grandfather V.T. Patterson who owned the grocery store in Kingsville. Pete’s first job was delivering groceries for his grandfather’s store. One day, while on a delivery, Pete saw a runt pig and asked the farmer if he could buy it. The farmer and Pete came to an agreement on price, and Pete purchased the pig. He raised the pig and the money he made from the sale of the hog after it was full grown, allowed him to purchase a bicycle, which he used in his grocery delivery business. His Grandfather Patterson not only taught his grandson responsibility and a good work ethic, but was instrumental in guiding his grandson to a close and loving relationship with his Savior, Jesus Christ. Pete was a 1947 graduate of Kingsville High School. After graduation, Pete took his savings and started buying and raising hogs. He built quite a hog operation before he was drafted during the Korean War. In 1951, before he left for Korea, he had to give up his livestock operation, so he took the money from the sale of his livestock and purchased a farm, never giving up on his dream that someday he would become a stockman. After proudly serving his country in Korea, Pete came back to Kingsville. On December 27, 1956, after a brief courtship, Pete was united in marriage with Mary Lou Snow in Gunn City, Missouri. After their marriage, they made their home on the farm Pete had purchased before the war and set about to make their dream of raising hogs and cattle come true. During this time, Pete also worked as a machinist for Allis Chalmers, then Bendix, and eventually ARMCO Steel, retiring in 1992. Mary Lou Hoover preceded Pete in death on December 20, 2009 and Pete continued to live on the family farm. Even in his later years, Pete was often seen at the Kingsville Livestock Auction where he not only enjoyed the sale, but loved visiting with friends and other stockman. Pete enjoyed listening to Billy Graham and attended his revivals when he came to Kansas City. He also had the opportunity to tour the Holy Lands, Cypress and Rome. Pete became very knowledgeable on the history of the Holy Land, and, after he returned from his trip, he put together a slide show which he presented at various meetings along with expert commentary. Pete was an active and devoted member of the Forest Grove Baptist Church. In addition to his wife Mary Lou, Pete was preceded in death by his father, Ernest Lee Hoover, Sr.: his mother, Mabel (Patterson) Hoover; two brothers, Ernest Lee Hoover, Jr. and Norman C. Hoover and one sister, Patricia Bunch. 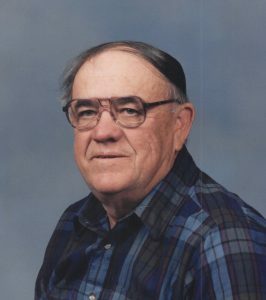 He is survived by his daughter, Jeana Ruth Mayfield of El Dorado, Kansas; three sons, Kim Hoover of Kingsville, Missouri, Tim Hoover and wife Gerilynn of Holden, Missouri and Hal Hoover and wife Sandy of Kingsville, Missouri; one sister-in-law, Rena Hoover of Sacramento, California; nine grandchildren, seven great-grandchildren, other relatives and many friends. The family of Herbert “Pete” Hoover will receive friends from 6:00 – 8:00 p.m. Friday, April 5, 2019 at the Wallace Funeral Home in Pleasant Hill, Missouri. Graveside Service with Military Honors will be held at 10:00 a.m. Saturday, April 6, 2019 at the Strasburg Cemetery, Strasburg, Missouri, with Pastor Todd Morris officiating. Full Military Honors will be provided by the United States Army and V.F.W. Post #3118 Honor Guard of Pleasant Hill, Missouri. The family suggests contributions to the charity of your choice in Memory of Herbert “Pete” Hoover. I didn’t know Pete well but met a couple times via my beloved Grandpa Ebb Stanger who met Pete in Korea war and worked with at Armco. I love your Obituary and I send my deepest sympathy to the whole family. I just lost my dad so I understand the pain and may God surround everyone with extra love.